How did it get to be almost fall already. The official first day is in 10 days! I feel I should be more prepared given that I’ve been guzzling pumpkin spice lattes as soon as they were released a couple of weeks ago but I’m still getting back into the regular work routine and planning my posts now that the kids are back in school. 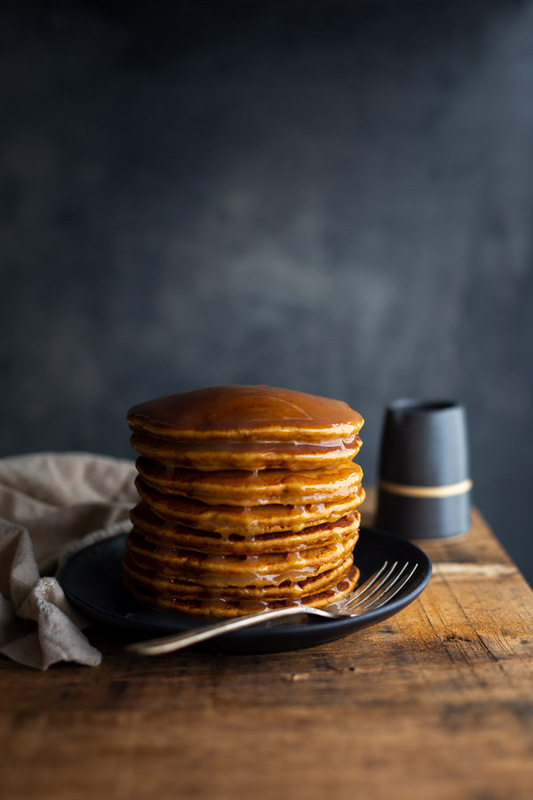 Fortunately, I recently made a batch of these gingerbread pancakes with lemon sauce for Sunday breakfast and realized I had not shared this recipe yet. And they’re perfect for fall. The fact that I got this recipe almost 20 years ago from the owners of a bed & breakfast we stayed at in Maine and it still remains a family favorite tells you how good it is. 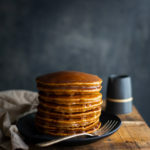 It is quick to mix together and if you simmer the lemon sauce while frying up the pancakes, you can be sitting down with your family enjoying a stack of hot pancakes within 30 minutes. The lemon sauce may seem like an unlikely pairing for gingerbread but I promise it really is worth the extra step. 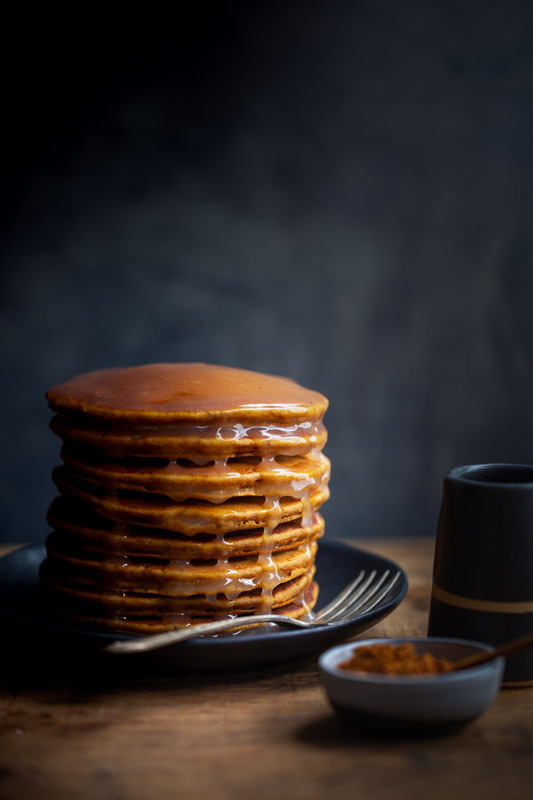 There’s nothing wrong with maple syrup as a topping but I dare you to try the lemon sauce with these gingerbread pancakes and not agree it’s the winning combination. I guess I can be ready for fall as long as I have these gingerbread pancakes to ease the transition. But, please, no one put up any holiday decorations yet. In a large bowl, whisk together flour, baking powder, baking soda, salt, ginger and cinnamon. Set aside. In a medium bowl, whisk together milk, molasses, and egg. Whisk in oil until combined. Add milk mixture to the flour mixture and stir just until combined (batter can be a little lumpy). Heat a heavy non-stick skillet over medium-high heat until hot (To test it, flick a little water into the pan. The water should skitter across the surface.) Lightly coat the skillet with non-stick cooking spray. 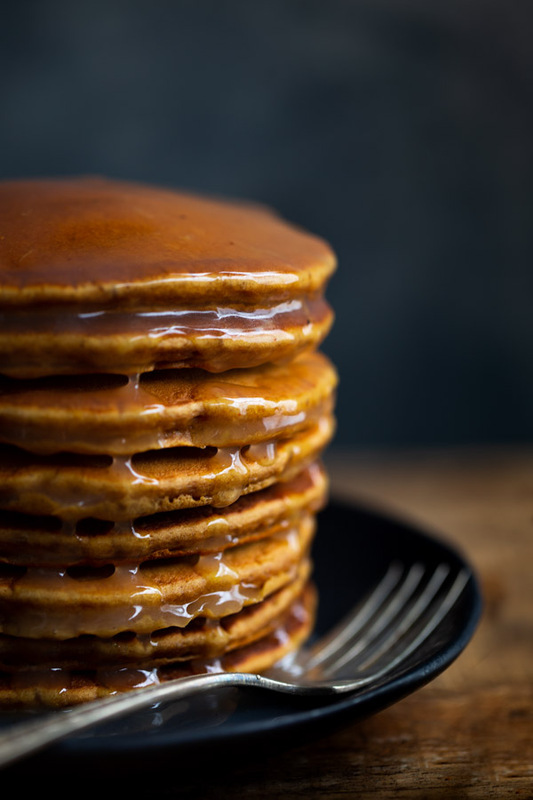 Working in batches, for each pancake, pour a scant ¼ cup of the batter into the skillet and cook until bubbles form on the surface, the edges are a little dry and the underside is lightly browned, about 2 minutes. Flip the pancakes and cook until the bottoms are browned, 1 to 2 minutes more. Serve hot with Lemon Sauce. In a medium saucepan mix sugar, cornstarch, and nutmeg together. Gradually whisk in water. Cook over medium heat, stirring occasionally, until mixture is thick and clear. Remove mixture from heat. Whisk in butter, lemon zest and lemon juice; stirring until butter melts. Serve warm. I’m Nguyet. Full time mom, part time everything else. Food blogger, food photographer, graphic designer, & WordPress/Genesis web developer. I’m always wondering what to make for dinner. Never miss a recipe. Get new posts delivered to your inbox.